I loved Spyro ever since it came out on the PSX back in the day and played it all the way through to its ending. There was just something so cool about this little dragon and his dragonfly buddy as they made their way through the various worlds that you have to battle your way through. The first and second game were awesome then afterward the series seemed to flatten out somewhat and I wasn’t sure if we were going to see a resurgence of it. Now we have a new Spyro title out on the shelves and with the title A New Beginning, it was interesting to see just what the heck they had in mind for the little guy. This one take us back to the beginning where we find that Spyro as a child thinks he is a dragonfly. A series of events unfold where Spyro and Sparx have an altercation in a forest where Spyro steps up and saves them both by breathing fire for the first time and as a result is told by his parents that he is actually a dragon, not a firefly. 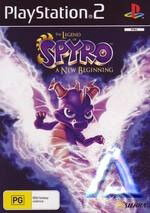 The mission then starts where Spyro tries to find his parents with his good buddy Sparx by his side. Whilst this is not quite the jump that they were probably looking for, this title is a solid game that long time fans are going to enjoy. Graphically, New Beginning is one sweet looking game with all sorts of funky effects being thrown in for some neat visuals that should be enjoyed by players. 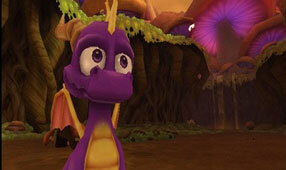 This game has a ton of big names doing the voices, with Elijah Wood doing the voice of Spyro and David Spade as Sparx. Whilst this adds some interest to the game, the script is a bit long winded at times and the actors clearly were not recording their bits together which has been confirmed by Wood in an interview about the game. Whilst there is a small amount of time learning how to control Spyro, the game will lead you through how to control your little purple friend. The things that the dragon can do in battle are pretty cool with a variety of combos that can be used and upgraded via a menu that can be selected in game. I think that fans of the series will be very happy with this new game. You can tell that a lot of time and effort has been put into the development and it has paid off. Gamers will be happy about the overall look and feel of how it plays. 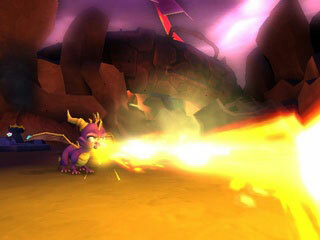 Spyro looks the best he has for some time and I’ll be keen to see the next Spyro on a next gen platform. Good stuff that the whole family will get a kick out of.